When we look at Gmail login page, we can see the space counting dynamically. What does it represent - does it mean that Google is dynamically increasing it's server space? What happens in the back end while the Gmail space gets dynamically increased? This is the code in charge of it. Looks like it is based on a time computation being mapped to a number of Bytes. Not the answer you're looking for? Browse other questions tagged gmail google or ask your own question. What causes the infinite redirect loop when I login to Gmail? How do I fix it? What does shva=1#inbox mean when Gmail loads? Gmail unusual activity, does it mean a successful connection has been made? How does Gmail store the “new look” flag? 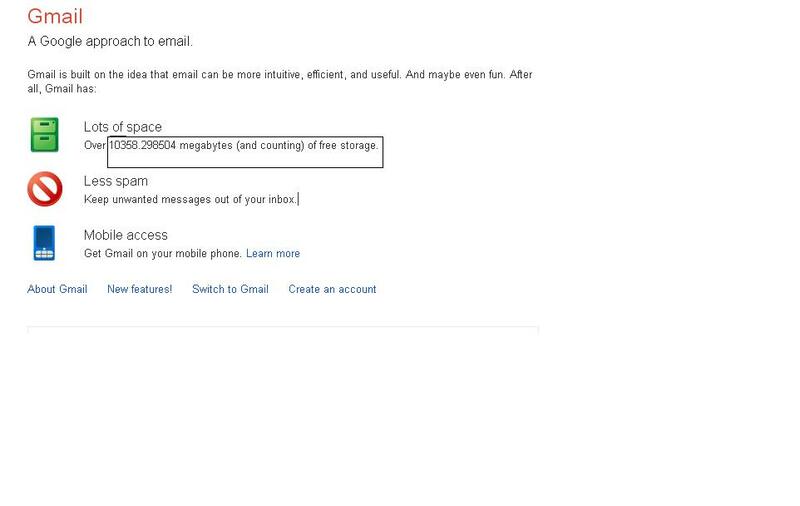 Running Out of Space on GMail, Now What? Why does the pre-filled Google login page never work for me?